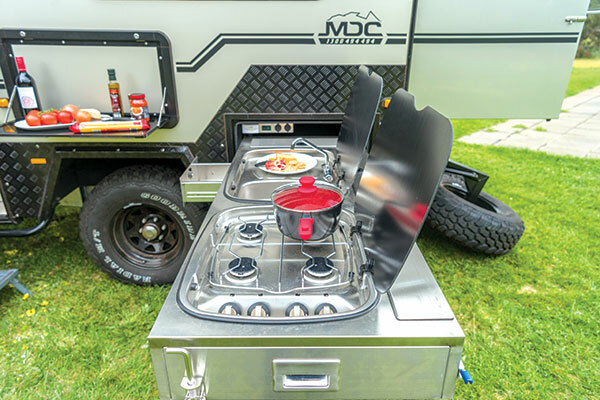 The lightweight MDC XT12 2018 is ready for action offroad, but the long list of comforts and $40K+ price tag are what earned it a second look at Caravan World's Best Aussie Vans program for 2017. The XT12's grand external kitchen allows for 'all hands on deck' after a full day of camping fun with shower facilities inside and out for a clean camp – no matter how muddy your adventures get. But did it meet the judges' expectations? The XT12 2018 is a great all-round touring package. It’s perfect for weekends away or long distance touring, and has had plenty of testing and development backing it to do just that. 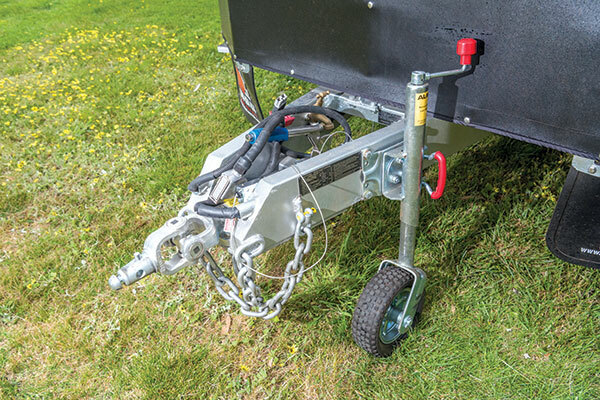 A five-year structural, drawbar and chassis warranty is enough to give anybody a vote of confidence, and the independent trailing arm suspension seems to work quite well. The rear fold-out section is interesting to use. You’ll need to drop the spare tyre rack every time you want to set the bed up, which seems easy enough but probably isn’t a massive hit for touring on the go. The XT12 definitely isn’t short on ground clearance. In fact, I’d go as far as saying your 4WD will bottom out before it does. Add in a set of mud tyres, electric offroad brakes and a much lighter shell than its predecessor and you have a set-up that's a bit of a weapon of the beaten track, especially for the price. What MDC has packed into this 12-foot van is exceptional, in fact, almost unbelievable. The XT12 2018 would be considered to be more a hybrid camper trailer than a fully-fledged van, but don't dismiss it out of hand. 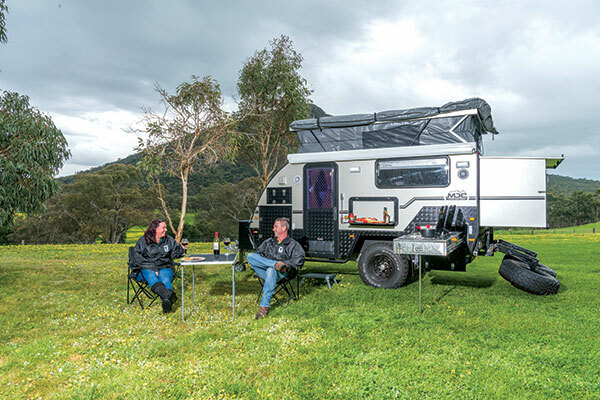 The body is an all-welded alloy frame unit featuring alloy composite panel work with checkerplate, protecting the lower section of the camper, and the fully galvanised chassis are all built overseas. Shipped to Australia, the complete suspension and all fittings and appliances are fitted here. The 6in chassis rides on independent trailing arm coil sprung suspension with four shocks keeping the ride under control, while the 16in rims are fitted with mud terrain tyres with braking provided by 12in electric brakes. 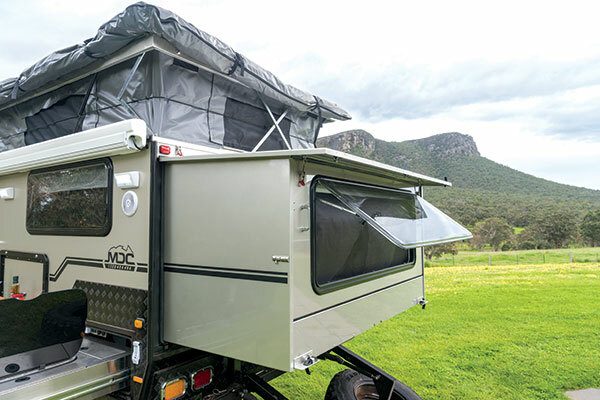 There's a bit of set-up time required for this unit but all in all it's pretty easy and you'll be wrapped up inside the fully erected camper in less than 10 minutes with ease. Inside there's a small toilet and shower, air-conditioning, a fold-up bed and a range of storage. Outside, there is an impressive roll-out kitchen complete with four-burner stove and sink and a front storage tunnel that can easily accommodate a 40L or bigger fridge freezer. 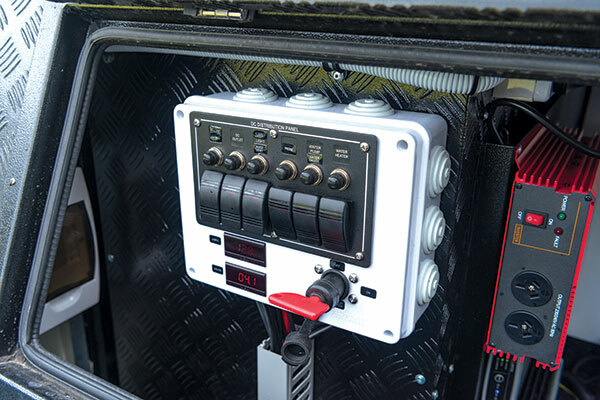 An impressive line-up of solar charging and battery storage plus good water capacity can having you enjoying life off the grid and in the wilds of Australia for as long as you want. Undoubtedly, the XT12 2018 is the oddity at BAV with its pop-top roof and extendible rear wall area. But I have to say that is the only odd thing about it – apart from the price, that is. It comes in under $45,000, making it the cheapest van at BAV. What you get for your money is a van with a towing length of just 3.9m (12ft 9in) and a Tare weight of just 2000kg. Just as a footnote here, it also comes with an ATM of 2800kg giving a rather amazing storage capacity of over 800kg. My advice – don’t try it, even though the XT12 does have a considerable amount of storage compartments. 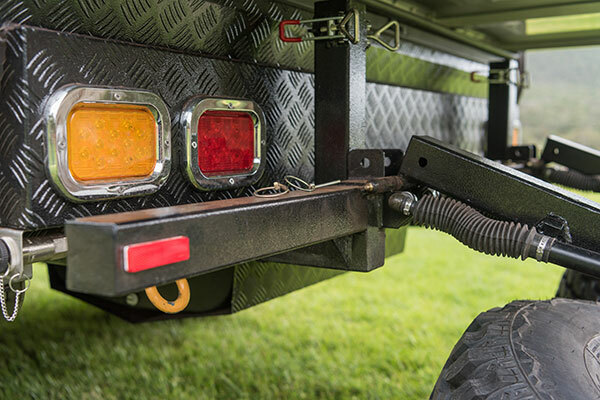 Instead, pack what you need and go for a smaller/lighter tow vehicle. 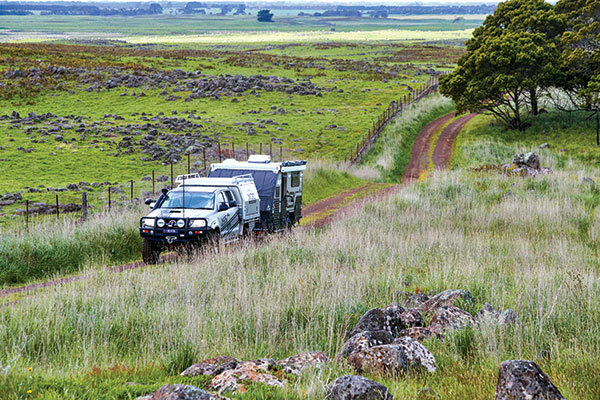 Which is what this pop-top van is ideal for, along with the ability to cope with narrow and undulating bush tracks, given the shorter towing length. 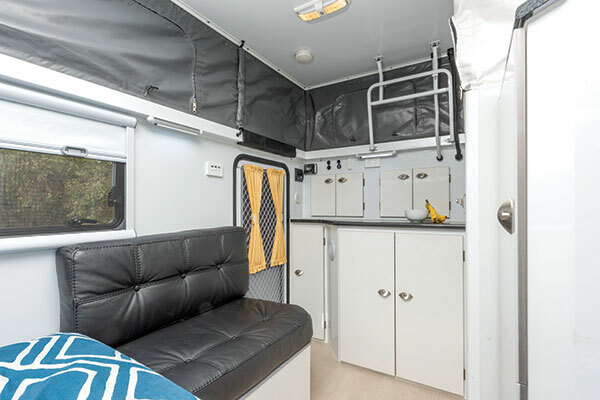 Okay, so the caravanning lifestyle is going to be a little different with the external kitchen and an inside bed that has to be made up every night if you're constantly travelling but the al fresco bit might suit you down to the ground! Although not quite conventional, you might well find it a fun way to travel. It’s not the ‘size of the dog in the fight’ but the ‘size of the fight in the dog’. And to that extent, the MDC XT12 2018 is a go-anywhere battle-wagon that will more than ‘nip at the heels’ at the harshest of Australian terrain. I feel sure this pocket dynamo will ‘sink its teeth’ into the budget hybrid market, given its functional layout and raft of features. From an external perspective, it is as tough as nails complete with ‘bulletproof’ cladding (5mm thick), effective use of checkerplate, faultless aluminium welds, and a rugged set of rock sliders. And it will take you beyond the ‘Black Stump’ – and back – in peace of mind courtesy of MDC’s own heavy-duty independent trailing arm suspension, a galvanised steel chassis (4mm thick) and aluminium frame. 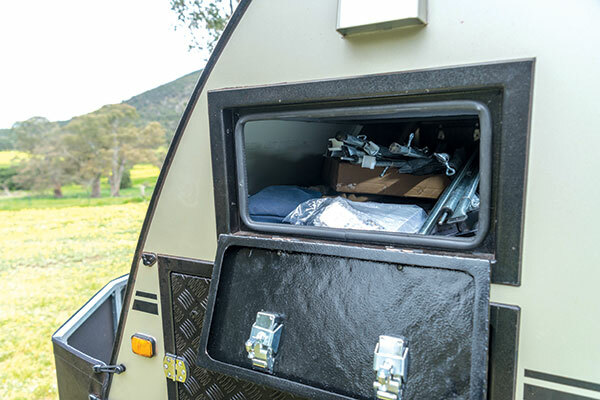 The XT12 also has an external cooking facility via a slide-out storage compartment at the front, two spare wheels at the rear-fold down to ground level, all the hatches are rubber sealed, a full-width tunnel boot is set higher than the norm, and the press-button 12V awning makes life easy. And if you’ve really got down and dirty out in the sticks, well, there’s an exterior shower (with an external shower tent) to preserve the inside of the van from grit and grime. As they say, ‘cleanliness is next to godliness’. 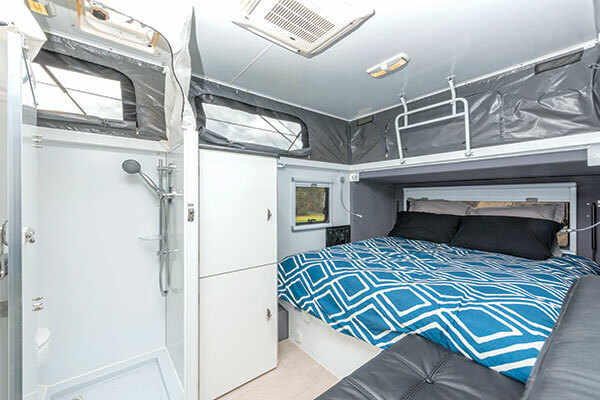 Meanwhile, the practical internal configuration is highlighted by a fold-out rear bedroom (with an innerspring mattress that folds in half) which extends 3ft and is a ‘30-second job’ to set up. The van also comprises a shower/toilet combo, and a sink for washing dishes and brushing teeth and so on. The XT12 is well-ventilated as the pop-top canvas has zip-up windows, while the walls have solid windows. You really get a great vista from the gigantic back window, and the internal lighting is fantastic. Whether it’s more camper trailer than caravan is debatable, but isn’t that a perennial question with most hybrids? But to which I’m certain, the XT12 is a camper trailer-slash-caravan that makes the thrill of outdoors adventure trouble-free and uncomplicated. 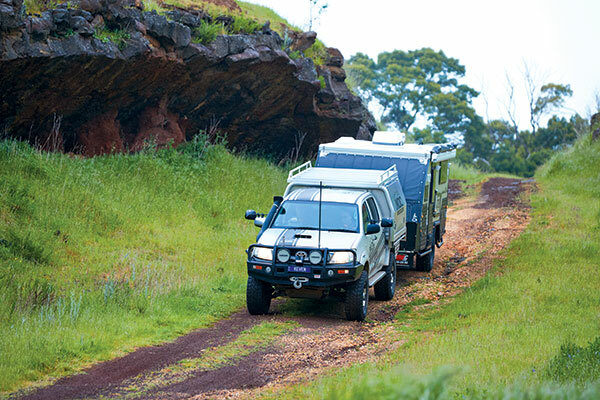 The full feature appeared in Caravan World #570. Subscribe today for the latest caravan reviews and news every month!